Joe Cole Splash Park. Photo by Robert Mann-Thompson. Our friends at Kidical Mass DC host an nearly monthly family-fun bike ride. This month, they’re headed to Joe Cole Recreation Center’s splash park, and we couldn’t be more excited! We’d also love your help getting the park tidy before they arrive. Please join us at the park at 9:00 am for a quick clean-up. That will give folks time to join the ride at Turkey Thicket (or at another stop as the ride moves east), and a chance to tidy up before it gets too hot out. Next ride: Saturday, July 21 SPLASHDOWN! 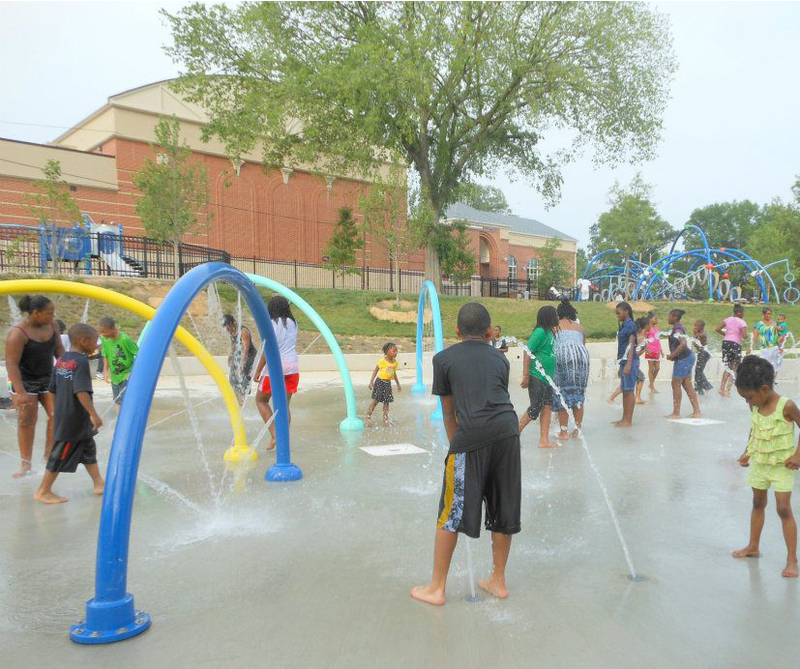 Cool off with us in the splash park at the newly-renovated Joe Cole Recreation Center. Once again, we’ll start out at Turkey Thicket Recreation Center in Brookland and coast downhill along the Met Branch Trail. After a quick swing through Near Northeast, we’ll bike up to the Rec Center for some noisy, wet fun in their new splash park. Afterward, anyone who’s hungry can join us for lunch at The Argonaut, one of H Street’s most kid-friendly dining establishments. We’ll have three meetups plus one optional meetup (depending on local interest): one at Turkey Thicket in Brookland, one at Met Branch Trail and R Street NE, and one at the southern terminus of the Met Branch Trail. If anyone from Capitol Hill or Near Northeast would like an additional meetup in their neighborhood, we can also make a slight detour to pick up more friends at the front of J.O. Wilson Elementary School at 6th Street NE and K Street NE. Be sure to bring swim diapers, sunblock, and anything else your family will need for extended outdoor splashtime. Difficulty: Easy-Intermediate. Mainly downhill and on a bike trail. A few short stretches on medium-busy roads. E-mail Megan Odett at kidicalmassdc@gmail.com with questions. Posted on July 17, 2012, in Events and tagged children, clean up, families, Joe Cole Rec Center, Kidical Mass DC, parents. Bookmark the permalink. Leave a comment.